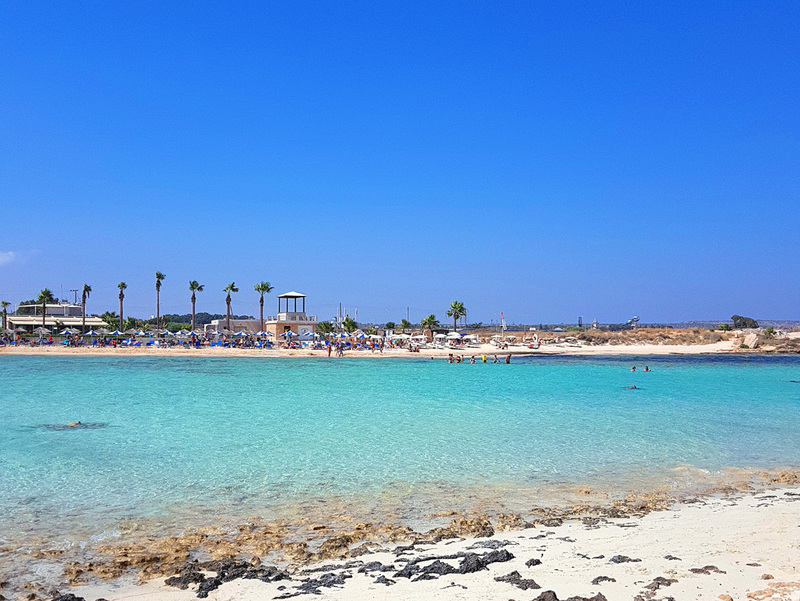 Famous for its stunning coastline, Famagusta District (Ayia Napa & Protaras) is one of the most favoured destinations for holidays, and Wattracts visitors from across the world for its sparkling seawaters, powdery white sands and its natural wonders. 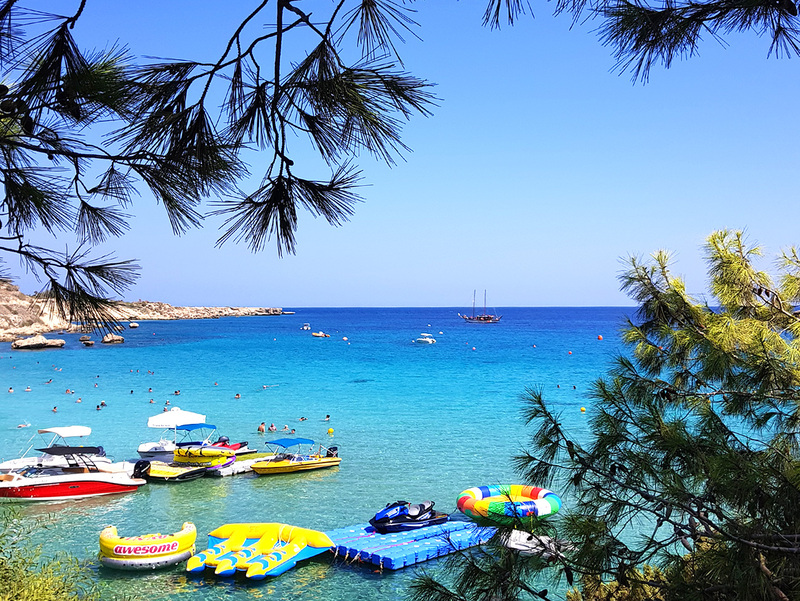 During the day enjoy the white sandy beaches with their crystal waters, there are rugged caves and coves to explore; underwater worlds to dive amongst, and have fun with the numerous activities available including boat trips along the coast. 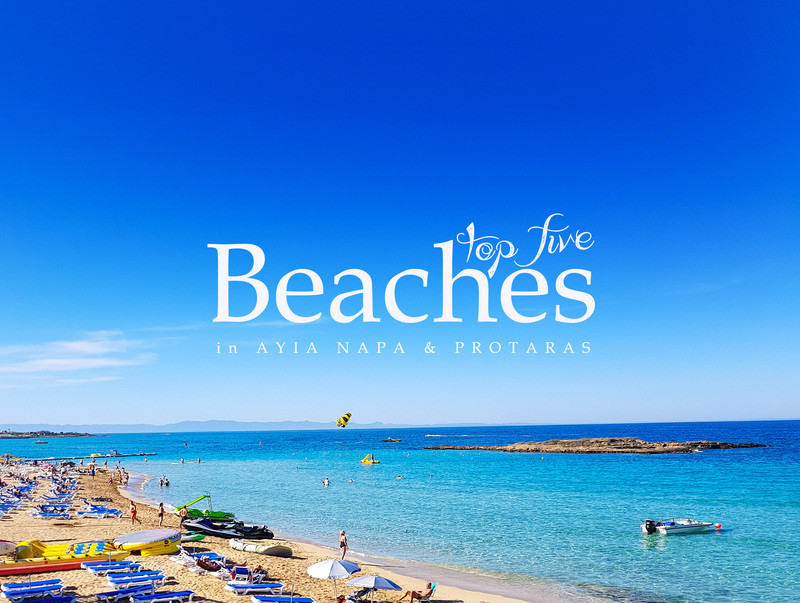 Here's a look at the five most amazing & famous beaches of Ayia Napa & Protaras. 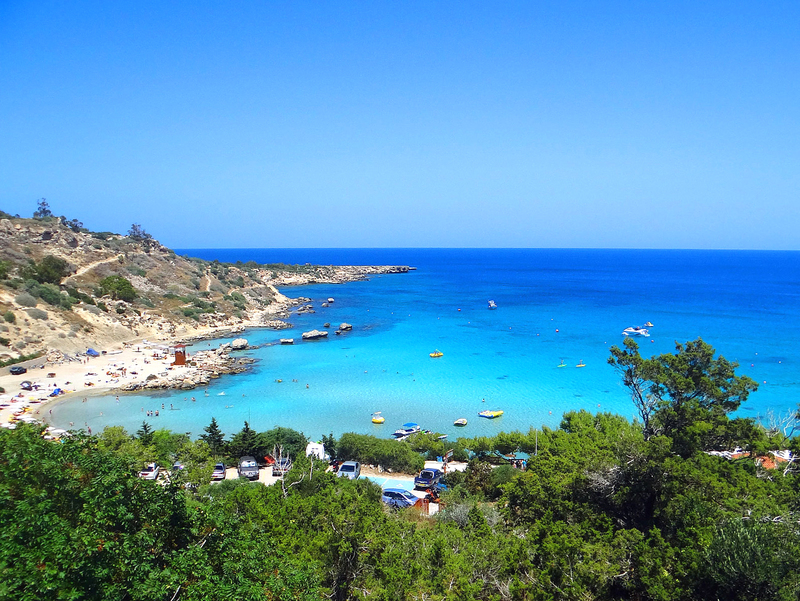 Located to the East of Agia Napa Konnos bay stands out from within the Cape Greco national Park. 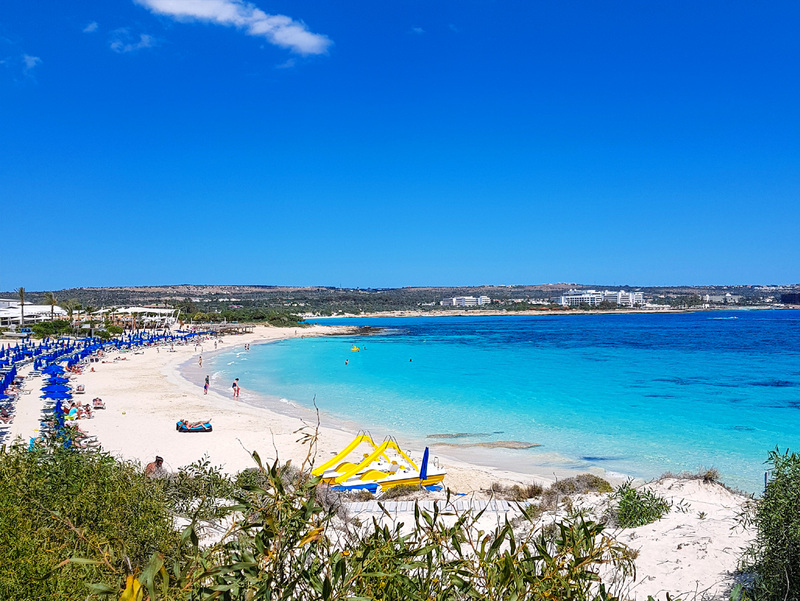 Found in between Protaras and Agia Napa the beach is prominent for its white sands and crystal water. Flanked by rocky hills full of pine trees the road to the beach offers excellent opportunities for amazing photographs. Access is also via the Grecian Park Hotel above. Special plastic sun beds tailor-made for this beach and which can be used on water, are available for rent. Many yachters drop anchor here to relax for hours. 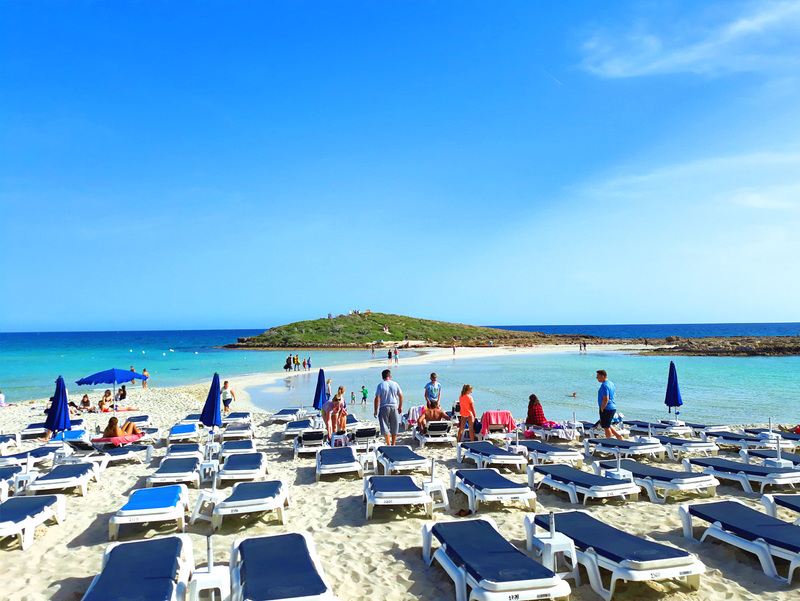 The beach Nissi Beach is located 3.5 kilometers West of Ayia Napa’s town centre. It is covered with fine golden sand and it is well sheltered from the winds, hence the mild waves. It is a beach with a rocky formation on its central and Western part. 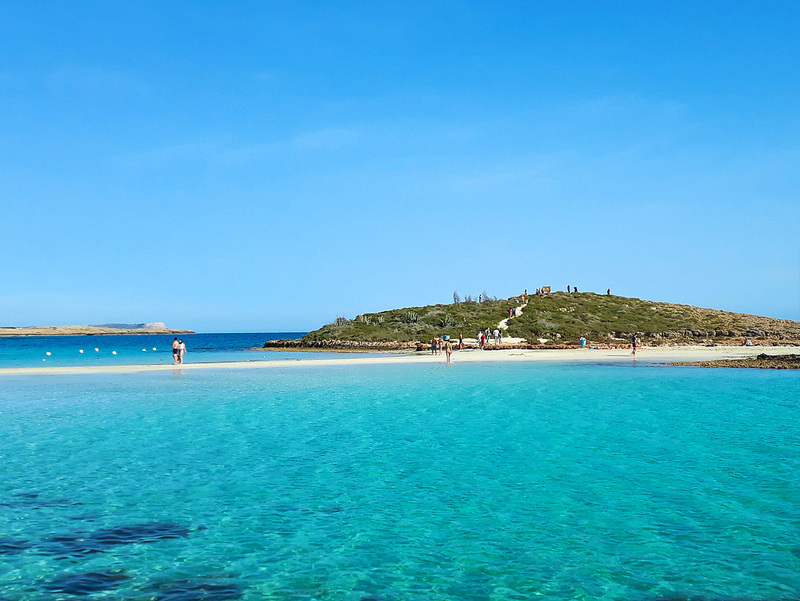 On the Eastern side of the beach, there is a small islet located a short distance from the coastline (45 metres). Due to the low-depth water between the small islet and the main coast, but also due to the relatively short distance between these two points and the effect of the coastal waves, we observe the union of the beach with the island through the formation of a unique sand lane. This phenomenon is remarkable and is considered a landmark, both for Ayia Napa and for Cyprus in general. In the immediate area there are accommodation facilities available for rent, restaurants, a kiosk, and family friendly bars. The bay is named after the solitary fig tree which stands at the headland of the beach and has overlooked the bay ever since its arrival with eastern invaders in the 17th century. 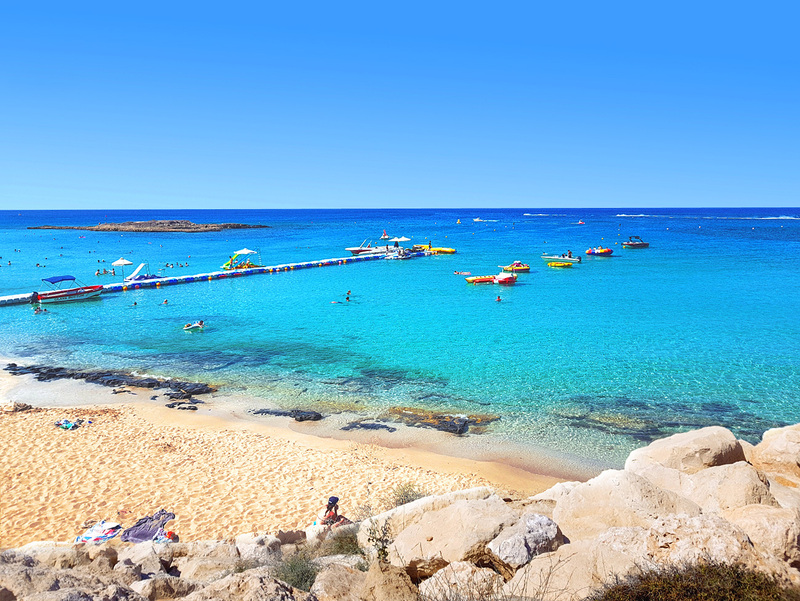 Fig-tree bay is Protaras’ coastal jewel in the crown. 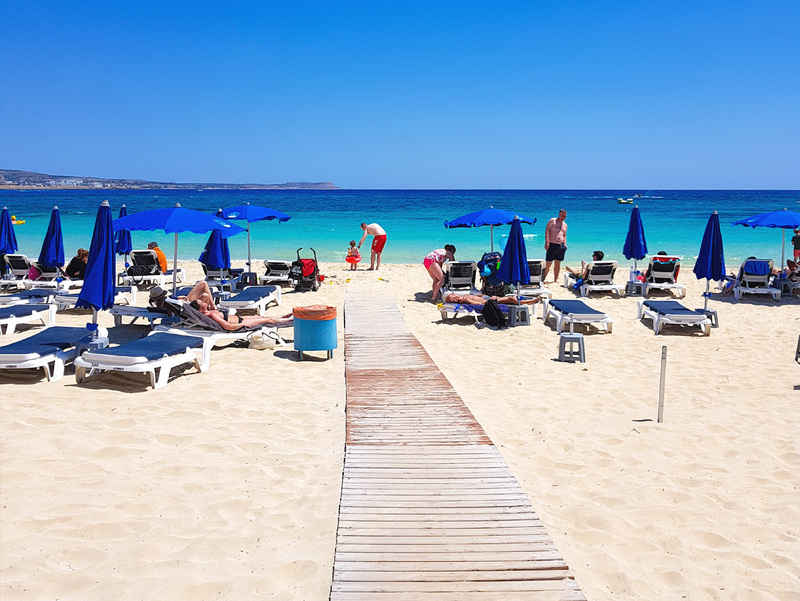 Its crystal clear waters and fine-grained, golden sand has made the beach very popular and is why it features today on Trip Advisor as among the best beaches in Europe. 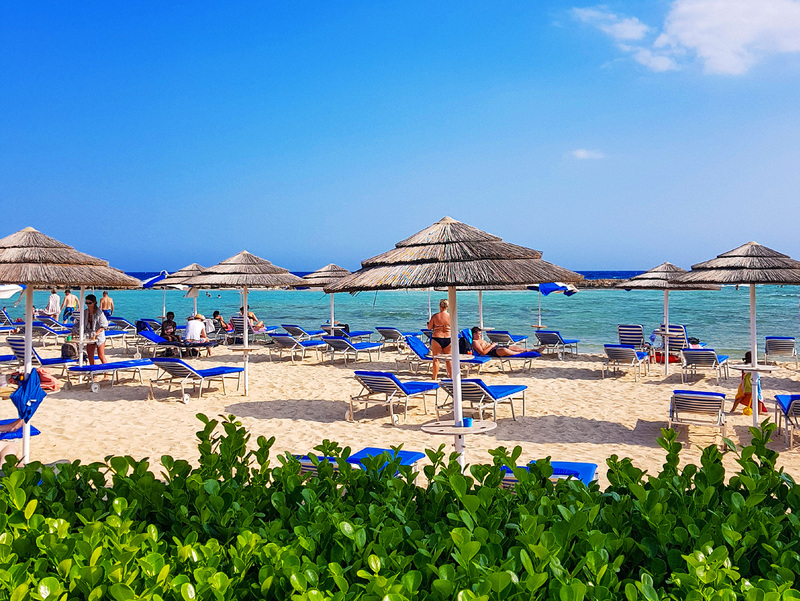 It has been awarded the prestigious Blue Flag for its outstanding water quality and public facilities and it is a Green Beach under the eco-initiative “Green Cyprus Beaches”. The islet at its north only serves to add to its splendour while simultaneously helping to keep the sea calm. It is easily accessible for exploration by adventurous swimmers. 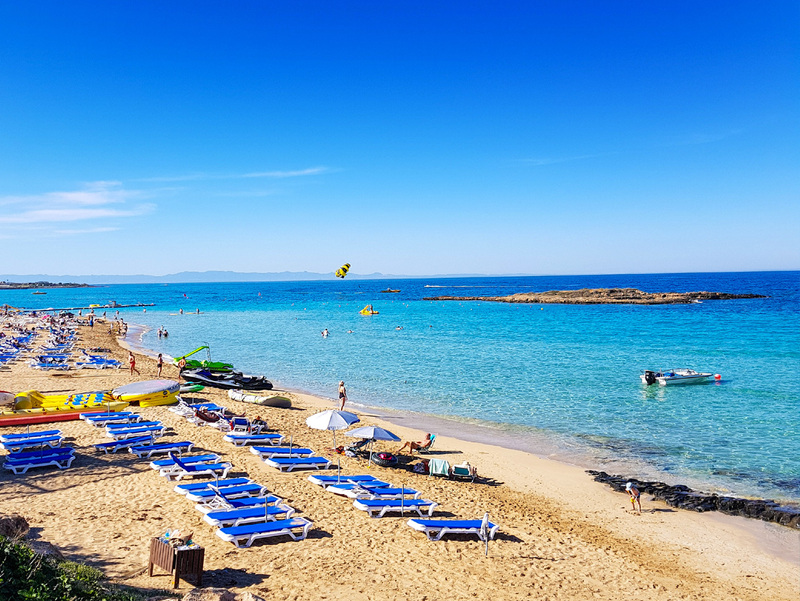 Fig Tree Bay offers excellent facilities, including sun beds and parasols available for hire and a wide range of water sports such as waterskiing and paragliding. It provides disabled access and is supervised by lifeguards. 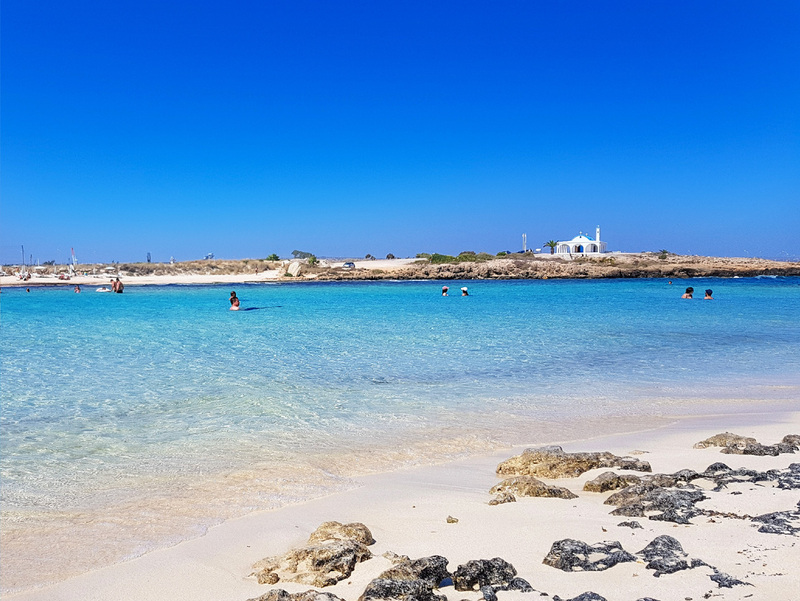 Makronisos Beach lies 5 km west from Ayia Napa’s centre. It is a golden sandy beach, covered with waves of average intensity. The beach was originally formed by a cluster of small bays. The small bays extend towards different directions; the first is Westerly, the second Southwest, and the third Southeastwards. There are accommodation facilities available for rent, restaurants, a kiosk, and other conveniences in the area. You can also visit the Necropolis (ancient city) of Makronisos and walk eastwards towards the beach Vathia Yonia, or head west towards Ayia Thekla beach. 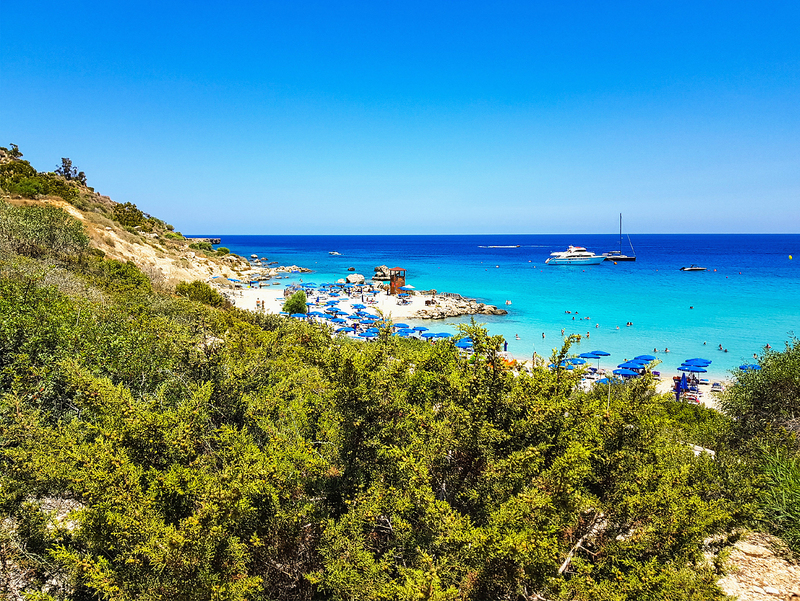 Agia Thekla (Saint Thekla) is a small beach named after the old small church which is has stood there for centuries. 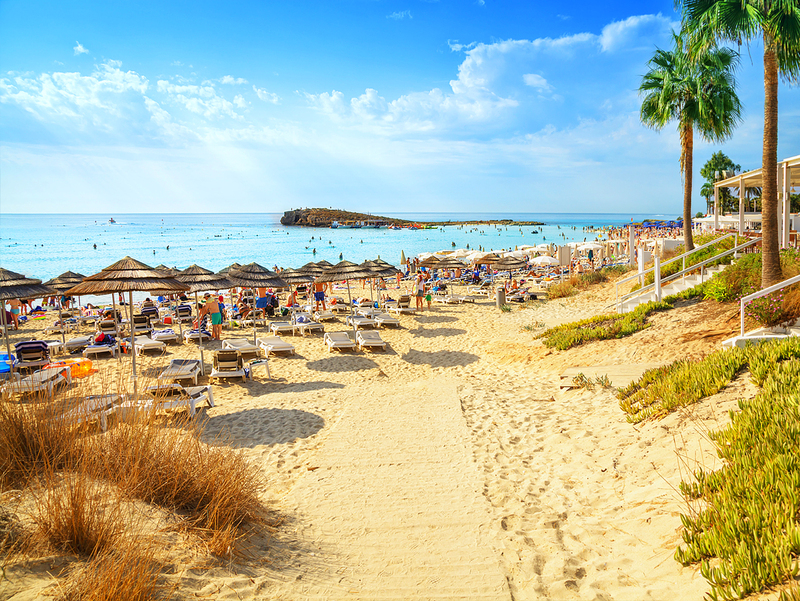 The beach, which lies a few kilometers from Agia Napa, is covered with fine golden sand and surrounded by crystal blue waters. The general area of Ayia Thekla is a huge development of villas, and a mix of residential and holiday lettings. 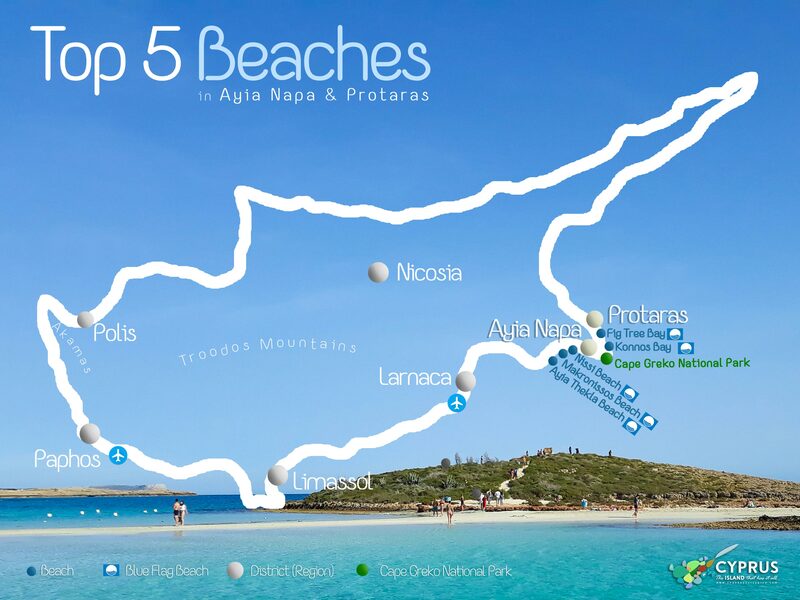 The seafront area of Ayia Thekla has its own beach as well as many smaller, secluded spots along the coast. Explore this wonderful area and take in the tranquility and beauty. 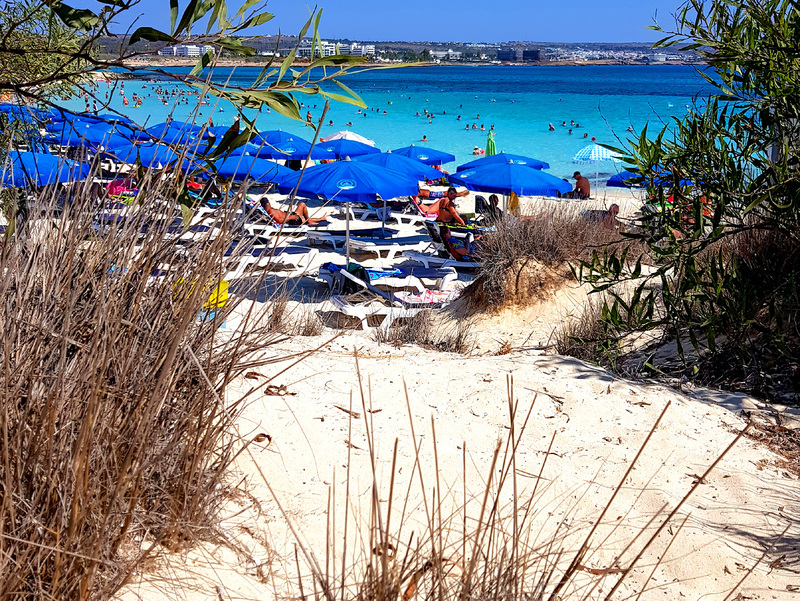 Looking for Hotels in Ayia Napa & Protaras? Explore our wide range of hotels in Famagusta District and find the perfect hotel for your stay. 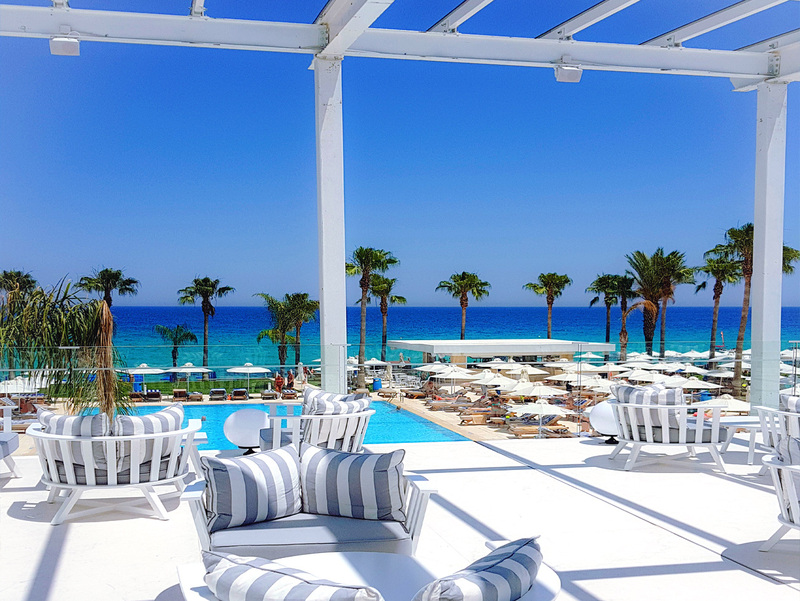 Book your Ayia Napa & Protaras hotel NOW !